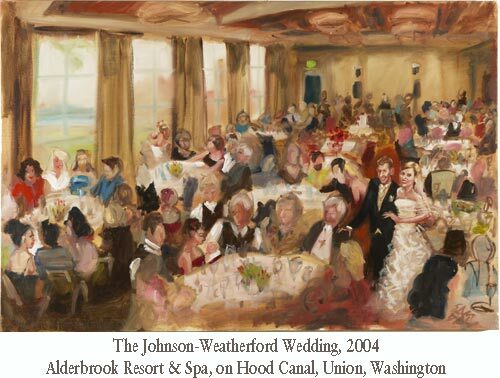 Every time I paint at a wedding, dozens of on-looking guests will tell me the same thing: “I’ve never heard of this! What a great idea!” And as often as time allows, I tell this story. I took that as a dare. My preparation, I believe, was in fifteen years of doing caricatures at events. Using ink and a brush, I have knocked out as many as 400 caricatures in a day— more than one a minute once I’m in the groove. But my experience with paint was more limited. Feeling unable to guarantee the results, but eager to try, I charged him only $500. I spent $350 of it on a portable easel, canvas, and a travel set of oils. I determined that oil paints would be most appropriate, because they dry slowly enough for errors to be simply wiped off and repainted. The smell of turpentine was a concern. But I bought an “odorless” solvent, which was much easier on the guests, and I now use a citrus thinner which actually smells quite nice. There was a very steep learning curve at this first gig, such as the need for me to bring my own illumination, and a small rug to use as a drop cloth. But I also learned that I can be tidy enough to paint in a tux, and even talk to guests at the same time. And I learned that people really do love this idea. Especially brides. I remember you showing me this painting in your gallery when I stopped by. And while I do think you did a good job, I can also see in your later work what you learned from this first experience. Great to see you blogging Sam. Keep on letting us know about your wins!